Electronic commerce, or e-commerce (e-com), refers to economic activity that occurs online. In other words, buying and selling of products or services over electronic systems like Internet. Ecommerce allows consumers to electronically exchange goods and services with no barriers of time or distance. Electronic commerce has expanded rapidly over the past five years and is predicted to continue at this rate, or even accelerate. In the near future the boundaries between “conventional” and “electronic” commerce will become increasingly blurred as more and more businesses move sections of their operations onto the Internet. All types of businesses, even small businesses which provide personal services, such as beauty and nail salons, can benefit from e-commerce by providing a professional website for the sale of related health and beauty products that normally are available only to their local customers. But how to choose the right platform for building an online store? There are several options available when it comes to choosing the right e-commerce software for creating your online shop. From free shopping cart solutions to those who charge you some fees for keeping your shop online, there are actually hundred of shopping cart solutions available out there. Unless the online store is only a small component of your website you should go with an open source e-commerce platform such as Zen cart, osCommerce, X-cart, Magento and etc. Most of these platforms are written in PHP and can be used in typical PHP/MySQL database environments. You get a feature rich back-end and admin dashboard with number of options for custom functionality in terms of third party extensions and plug-ins. These features allow you to easily create, manage and sell products or services online. 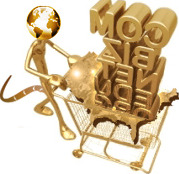 The shopping cart allows you to accept a wide range of the most popular payment options. You can create special discount codes, coupons and special offers. There are a lot of features such as Inventory management, automatic shipping and tax calculation available with these e-commerce platforms.